​​Can Fleas Live In Human Hair? Fleas are a menace for our pets and can cause distress and irritation to us humans, too. If you’ve managed to get a flea infestation in the home, it’s not unusual to start itching— from both their bites and simple repulsion. When faced with fleas, many people start to worry that these parasites will take up permanent residence on their body. There are many rumors about unlucky individuals having a head of hair infested with fleas, but is this really possible? In this article, we examine whether or not fleas can live in human hair. How Do Fleas Get in Your Hair? Will Fleas Stay and Live in Your Hair? 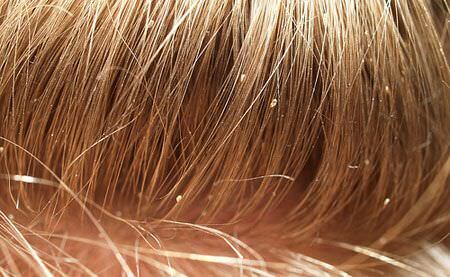 Will Fleas Lay Eggs in Your Hair? Are There Any Ways to Stop Fleas from Getting into Your Hair? In order for fleas to get into your hair, you would have to hold a flea-infested pet close to your head or be lying down somewhere which has fleas. Although fleas are known for being able to jump vast distances relative to their size, these distances are still very small in human terms. A study found that cat fleas (the most common type of flea) can leap a horizontal distance of about 8 inches on average. The longest leap was 19 inches, but this is uncommon. Most adult cat fleas are less than ⅛ inch long, so a leap of this distance is very impressive, being around 160 times their length. In terms of height, fleas were originally believed to be capable of leaping as high as 13 inches vertically. More recent studies have found that this is not true. Fleas can jump to heights of an average six inches, with the highest jump recorded being 7.9 inches. Clearly, fleas are not capable of leaping into your hair from the ground, even if you were sitting on the floor. A leap of six inches high will only bring the flea up to the ankles of most adult humans. This is why most flea bites are congregated around the ankle area. Fleas will usually simply have a quick feed and then leave when they are done. But, could a flea climb from your ankles to your hair? The majority of flea species are able to climb. After all, when they emerge from their cocoons, they have to crawl upwards out of their hiding place to be able to reach a host. Inside your home, that will entail climbing up carpet fibers to reach the top of the carpet. Whereas outdoors, they will climb up to the top of blades of grass. That said, fleas do not climb up the legs and bodies of humans to hide in their hair. The same is true for the pubic area, fleas will not be climbing up and hiding there either. Once a flea has found bare skin, they will bite and feed for a little while and then be on their way. On this basis, the only way a flea could get into your hair is if a flea-infested pet lays by your head or is sleeping on your bed, or you lay down on carpet which has fleas emerging from it. Once upon a host, adult fleas wish to stay there for the rest of their lives. They do not willingly leave their host, instead, they are either dislodged when your pet grooms themselves or they’re forced to leave due to the application of a repellent. Cat fleas will take the opportunity to feed upon many different warm-blooded mammals. They do have preferred hosts, which they are biologically designed to live, breed, and thrive upon. These are cats, dogs, and other furry mammals though. Humans are not a preferred host for fleas. Humans which share an environment with fleas will still often get bitten, especially if there is no preferred host around. When fleas emerge from their cocoons, they will need to feed as a matter of urgency. So, if a human foot comes by, they will not hesitate to leap aboard and feed. Overall, we are simply another warm-blooded mammal as far as fleas are concerned. They are not fussy when it comes to acquiring a meal, but they will leave as soon as they are satiated. A flea which has landed upon a human will generally bite 2 or 3 times before they depart. They can feed upon our blood for as long as seven minutes at a time if they are undisturbed. For those concerned that fleas will choose to reside in your hair if they manage to reach it, the answer is that it is highly unlikely. Fleas are designed to live on animals with densely packed fur, and not humans. Furthermore, fleas will only be able to live and breed on the animals which are their preferred hosts, such as dogs and cats. This is because fleas have evolved in tandem with these hosts over thousands of years. The only real exception to this is a particular species of flea which is known as the “human flea” or “chigoe flea.” This flea is extremely rare in the US, tending to reside in more tropical areas. This flea is very well adapted at living upon humans, burrowing into the skin where it feeds and lays its eggs. If you have very dense frizzy hair, or a full, matted beard, there is the potential that fleas may get inside and not immediately be able to find their way out after feeding. But they certainly are not actively trying to stay there. As we’ve mentioned, humans are poor hosts for fleas. While a steady diet of human blood will enable a flea to survive, they will not be able to breed and reproduce on human blood alone. Female fleas must feed continuously on their host’s blood before they are able to begin laying eggs. Once they have started to lay, they must be able to feed at will to sustain their demanding metabolic process. If a female flea only has access to human blood, her fertility will be almost completely stunted, and it is highly unlikely she will be able to lay eggs. When fleas are living and feeding upon their preferred host, they can lay as many as 30 eggs every single day. Because of these factors, it is unlikely that you need to be concerned about fleas laying eggs in your hair. If a flea manages to get into your hair or a thick beard, they will feed if they can, before trying to find their way back to their preferred host. If there is no preferred host around, they will probably stay and feed. But they will not be fertile or well nourished enough to breed. Although it is unusual to observe fleas spending any length of time upon humans, if there’s a particularly serious infestation and a lack of pets, you will be the only target. In order to get rid of fleas, you will need to adopt a multi-pronged approach to personal hygiene and home treatment. As we touched upon earlier, if a flea is going to be in your hair, it is likely to be in a bushy beard, dreadlocks, or thick, dense hair. Therefore, it is super important to keep your hair well combed if you can, and keep it clean. A good tip is to tie the hair up tight and slicked back in a bun so there isn’t much hair for a flea to get stuck in. Strong smelling shampoos, which have ingredients like tea tree, eucalyptus, and rosemary, are good flea repellents to encourage any fleas to move on out. Of course, if you have any furry animal pets in the home, they are almost certainly suffering too. You must treat them for fleas as a priority, as they will be the home for the majority of the adult flea population. It is fair to say they will be very uncomfortable themselves if you have enough fleas around that they are starting to find their way into your hair. Treating your pet and yourself is an important step, but you must not overlook the enemy within the carpet or cracks in the wood floor. Flea eggs do not stay on the host, they are designed to fall out from the fur into the ground. In your case, that means your floors and carpet are likely littered with flea eggs and larvae. This is a time bomb waiting to go off. If you don’t get rid of the flea eggs and other life cycle stages from your home, it is only a matter of time before they return. They believe the vibrations are signs of hosts moving nearby, so they break free and start to emerge—only to be sucked up. You may have to vacuum intensely every few days before you get them all. Vacuuming is a great way to hit fleas hard, but you will also have to deal with soft furnishings and textiles which cannot be vacuumed. Ensure to remove your bedding, pet toys, and pet bedding, cushion covers, etc. and wash them on a very high temperature to kill fleas and flea eggs. If you have access to a steam cleaner, this is a sure-fire way to eliminate fleas from the carpet and furniture, no matter what stage of the life cycle they are in. The thought of fleas living in your hair is enough to make anyone start to furiously itch and want to jump in the shower immediately. Luckily, as we have seen in this article, the potential for fleas living in your hair is very slim. Fleas will bite and feed on humans, but the reality is that they do not wish to live on us. If there’s no preferred host around, they can end up getting into dense human hair. They may feed there and be unable to find a way out, but it’s not where they really want to be. Fleas will not lay eggs in human hair because our blood is not nutritious enough to support their fertility and ability to reproduce. So you can rest assured that it’s highly unlikely to occur. Simple personal and home hygiene methods are effective in tackling fleas. So long as you treat your pets and home thoroughly, you should be free of these pests in no time.